Fancy Dress Beer – MostlyAboutBeer…….. The creatures in this image wouldn’t have been conceivable a year ago, but might only seem tentative twelve months from now. We have an imperial Gose made with beetroot, lemon peel, coriander and black salt. 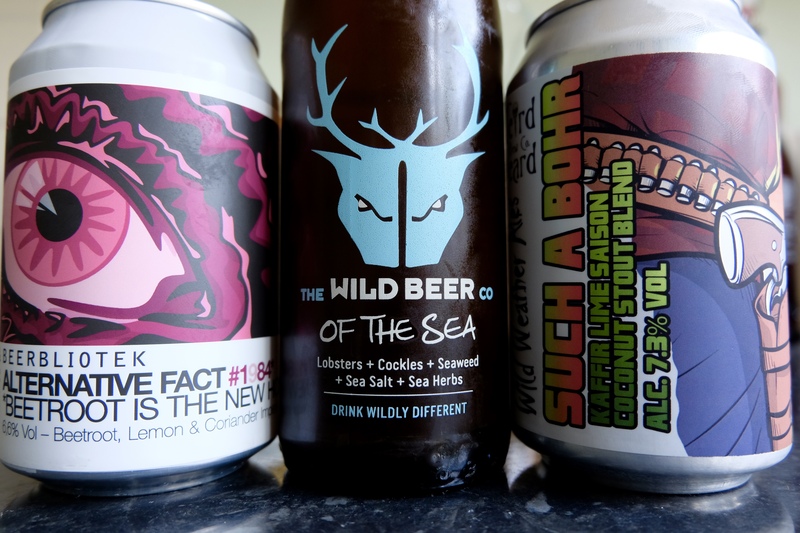 We then have an ale suffused with lobsters, cockles, seaweed and “sea herbs”, and finally a kaffir lime Saison blended with a coconut stout. So to recap, beer with taproots, crustaceans, molluscs, coconut, salt, fruit, algae and plants. How should we define brews like these when they stray so far from the traditional four ingredients? Beer in its glad rags? Masquerade ale? Bière de grand guignol? I settled for fancy dress and what we’re here to ascertain is whether they wear these garbs proudly or just got changed in the dark. Is there anything in this qualified experimentation? Are these three concoctions still actually beer? And so to the fancy dress ball….. It pours an ectoplasmic pink like the brightest flush of rhubarb. The short-stay head is fluffy and as flamboyant a hue as candy floss. I notice small particles swirling in the vortex. There’s no mention of can-conditioning so this might be beetroot pulp. On the nose, it smells like a well-used flannel; soaking wet and sweaty – this will no doubt be the salt that represents a Gose. 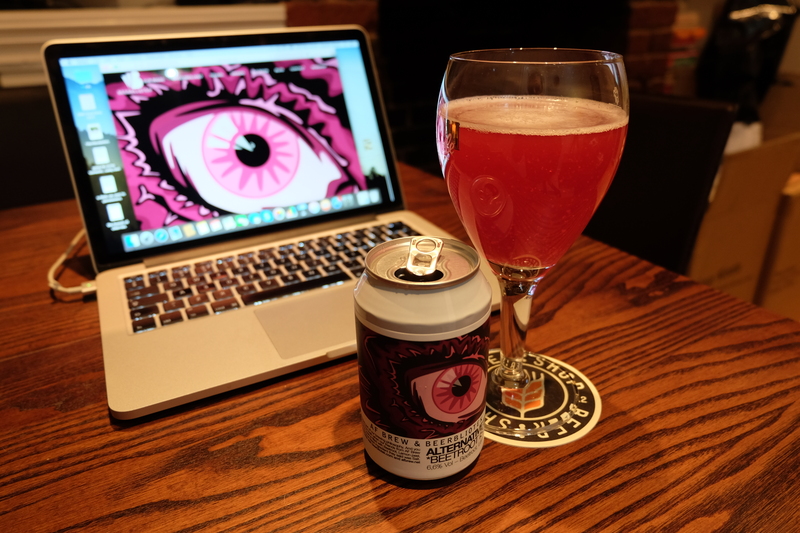 The divisive Gose – I don’t think I’ll ever get used to sipping a beer and licking the salt from my lips. There’s also a tart citrus rind note in there. I swig it. I’m happy to report it’s not only carbonated but refreshing too. The first taste I pick up is bittersweet like a blood orange but then the beetroot starts to come through loud and clear. Think of the sweet cytoplasm you get pooling on the chopping board when you grate the imperial purple one. So, unsurprisingly, it’s like drinking a beetroot salad. If you enjoy Pimms, you might be cool with this. I could imagine drinking something like this in summer, and not just because the colour makes me nostalgic for cherry Slush Puppies (do they still exist?). It contains corn, wheat and rye malt in the grain bill so this kind of fills the role of the yoghurt in a smoothie. 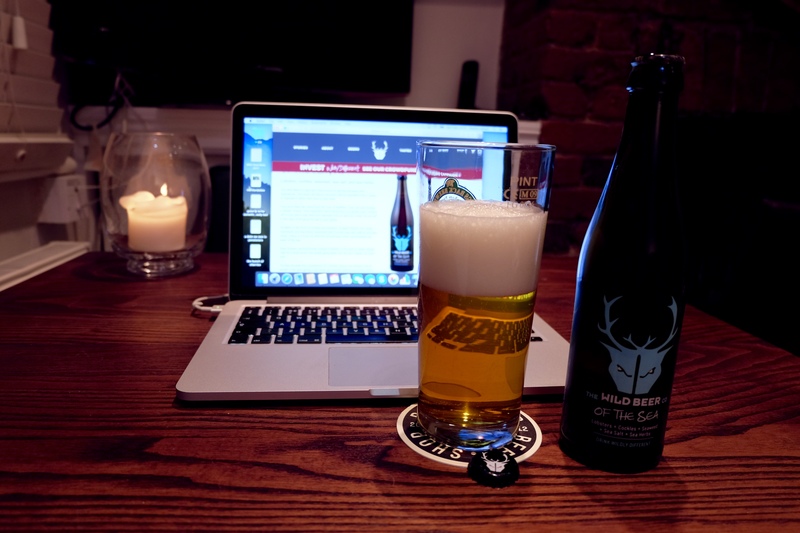 Out of this trio, Wild Beer Co is the producer I know most and hold in high esteem. Even given their infamous creative wont, this beer just seems mad with the addition of lobster, cockles, seaweed, sea salt and star anise. Emptying into the glass, the liquid is a gorgeous glowing straw gold and is crystal clear. A huge lily rocky head lunges up and it sticks around. It looks like a Pilsner but that’s as far as the comparison can be pushed. The aroma is elusive. It takes me a lot of swirling, cupping, inhaling etc to get any handle on it. My first approximation is strawberries and cracked pepper but then this ripens and I get a facial tan of sweet rich crab meat like unscrewing the top off a jar of Prince’s crab paste. I should say at this point that I’ve never had lobster so don’t recognise it. I’ve had langoustines/Dublin bay prawns but remember little of their taste or fragrance. I take my first mouthful. I’ve never tasted a beer like this before and I’m afraid it’s simply my previous analogy writ large: I’m eating crab paste sandwiches on white bread – this beer is the sludge I chew it into. What you get on both on the nose and the palate is a complete side swipe to what your eyes tell you. Blindfold, this would be murky. Instead, the beer looks like clarified honey. I get a touch of heat – a little spice that might derive from the star anise also used in the brew. It impresses me by dutifully fulfilling Wild Beer Co’s mission statement to create a beer based on a lobster bisque. That’s been achieved. It has carbonation and malt but in no way is it refreshing. It decants a dark treacle brown but this turns immediately to a foam that fills the glass. It’s one of those beers that you glaze over watching to settle but eventually it does. The expanded head is toasted, velvety and stubborn. It smells like sweet coffee or coffee cake with a sprinkling of Demerera sugar. I sip it. I get the levity – the fluorescent green of the limes followed by a full roast coffee nebula. I then get the stringy gnashy coconut too. This is everything in all directions at once. Each of the disparate and contradictory characters seem to survive with their identities intact in this maelstrom. This is a blend – they can so often be like mixing paints on a canvas and ending up with a muddy brown. This beer isn’t like that, it’s like the individual colours in refracted light. No ingredient overpowers the others; this beer is a perfect socialist state. These chimeras each made me sit up in some way. None of them is horrible but each is trying to get its foot onto the same stage as beer and so should be judged accordingly. I’ll be curt: If I had to vote one out, with regret due to my adoration of the brewery, it would be Wild Beer Co’s Of The Sea. It tasted like something I want to eat. I love sausages but I don’t want my beer to taste the same as them. I’d next drop Such A Bohr. Why? 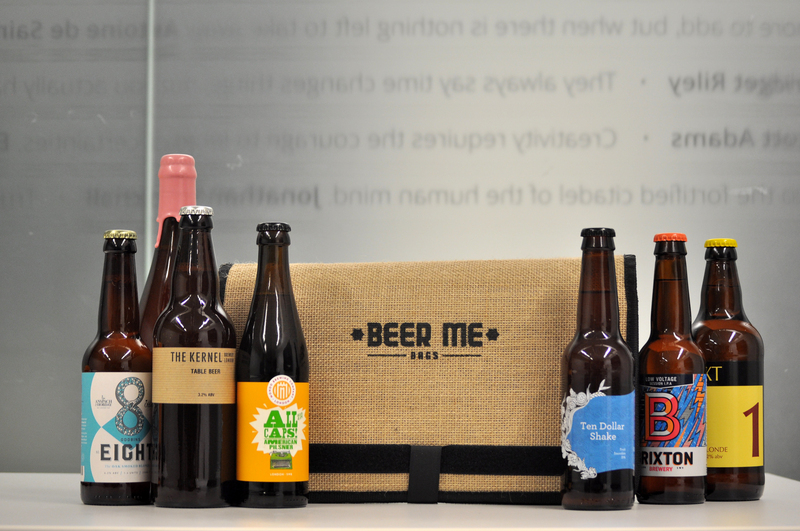 Because even though it demonstrates brewing craft, it’s just too busy. Less is more but does make me reflect on a lot of people’s reason for disliking black IPAs – a style I love. They don’t like the sensory contradiction of the verdant citrussy hops paired with the unction of roast coffee. 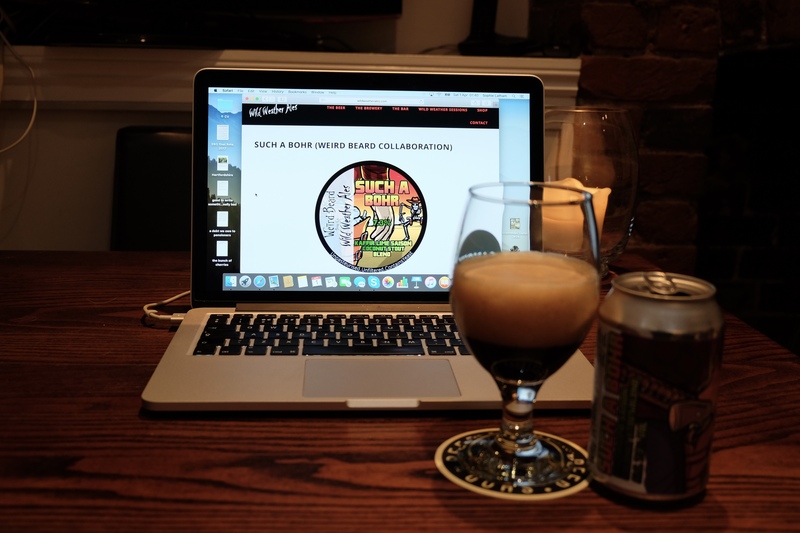 This beer is almost a caricature of that – the style taken to its logical conclusion and where some draw that line at black IPAs, I draw it here. I think many would love this beer. And so back to the beetroot. If I was going to drink any of these beers again it would be this one. Despite the shopping list of ingredients, it’s actually the simplest one in this line-up and remembers that one of beer’s strong suits is that it should be refreshing (not an absolute rule – an imperial stout certainly isn’t) and it hits that spot. The beetroot doesn’t replace the hops in their aroma and bittering capacity. One thing a great Lager will always have over this is the dry aftertaste that sends you diving back in for more. So no – beetroot is not the new hops it’s still just beetroot. This is a refreshing low-alcohol cocktail and about three of your five a day.